Katherine Eunice Schwarzenegger (born December 13, 1989) is an American author and the eldest child of actor and politician Arnold Schwarzenegger and broadcast journalist Maria Shriver. In 2010, Schwarzenegger wrote a book entitled Rock What You've Got: Secrets to Loving Your Inner and Outer Beauty from Someone Who's Been There and Back. Schwarzenegger uses the book to describe her personal journey and encourage other young women to achieve confidence and a positive self-image. She had body-image issues between fourth and seventh grade, but now controls her physical and mental health with walking exercises and yoga. 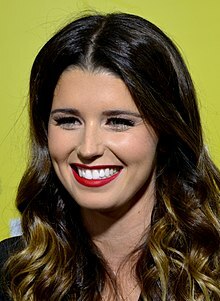 Katherine Eunice Schwarzenegger (born December 13, 1989) is an American author and the eldest child of actor and politician Arnold Schwarzenegger and broadcast journalist Maria Shriver. In 2010, Schwarzenegger wrote a book entitled Rock What You've Got: Secrets to Loving Your Inner and Outer Beauty from Someone Who's Been There and Back. Schwarzenegger uses the book to describe her personal journey and encourage other young women to achieve confidence and a positive self-image. She had body-image issues between fourth and seventh grade, but now controls her physical and mental health with walking exercises and yoga. After graduating from the University of Southern California in 2012 and unsure of her next steps, Schwarzenegger sought career advice from a variety of people, including athletes, singers, entrepreneurs and actors. She compiled their wisdom into her second book— I Just Graduated . . . Now What?—which was released in 2014 as a "survival guide" for recent college grads. In 2017, Schwarzenegger authored a children’s book, Maverick and Me. The book tells the story of how Schwarzenegger rescued and subsequently adopted her dog, Maverick. Using her own experience as a "foster fail" (when a foster home turns into a "furever" home), the book touts the benefits of pet adoption and rescue. Schwarzenegger is an American Society for the Prevention of Cruelty to Animals Ambassador and supports the Best Friends Animal Society. Katherine was born and raised in Los Angeles, California. She is the eldest child of actor and politician Arnold Schwarzenegger (Austrian-born), and journalist and author Maria Shriver (of Irish and German descent), whose mother Eunice is a younger sister of former President John F. Kennedy, and father Sargent Shriver was a U.S. Ambassador to France and the Democratic nominee for Vice President of the United States in the 1972 election. She has a younger sister, Christina Schwarzenegger, and two younger brothers, Patrick and Christopher Schwarzenegger. Through her father, she also has a half-brother, Joseph Baena. As of January 13, 2019[update], she is engaged to actor Chris Pratt. Schwarzenegger, Katherine (2010). Rock What You've Got: Secrets to Loving Your Inner and Outer Beauty from Someone Who's Been There and Back. Voice Publishing. ISBN 1-4013-4143-8. Schwarzenegger, Katherine (2014). I Just Graduated ... Now What? : Honest Answers from Those Who Have Been There. Crown Archetype. ISBN 978-0385347204. Schwarzenegger, Katherine (2017). Maverick and Me. ISBN 978-0824956875. ↑ "The Birth of Katherine Schwarzenegger". California Birth Index. Retrieved January 14, 2019. ↑ "Rock What You've Got: Secrets to Loving Your Inner and Outer Beauty from Someone Who's Been There and Back" Archived February 2, 2014, at the Wayback Machine, Publishers Weekly, December 20, 2010. Retrieved January 28, 2014. ↑ "Katherine Schwarzenegger shares advice on body image", USA Today, September 13, 2010. Retrieved January 28, 2014. ↑ McKenzie, Lesley. "I Just Graduated...Now What? Katherine Schwarzenegger Shares the Best Advice from Her New Book". Teen Vogue. Archived from the original on May 17, 2018. Retrieved May 16, 2018. ↑ Wong, Stephanie. "You Should Fail to Succeed—Katherine Schwarzenegger Tells Us Why". POPSUGAR Career and Finance. Archived from the original on May 17, 2018. Retrieved May 16, 2018. 1 2 "Schwarzenegger daughter puts heart into book about adopting dog". ajc. Archived from the original on May 11, 2018. Retrieved May 10, 2018. ↑ FOX. "Katherine Schwarzenegger: Holiday gifts that give back". KTTV. Archived from the original on May 11, 2018. Retrieved May 10, 2018. ↑ "Governor Arnold Schwarzenegger's Brentwood High School Commencement Speech". gov.ca.gov. June 7, 2008. Archived from the original on June 18, 2008. Retrieved June 22, 2008. ↑ Pace, Eric (July 24, 1991). "Chronicle". New York Times. Retrieved April 18, 2008. ↑ Brozan, Nadine (September 21, 1993). "Chronicle". New York Times. Archived from the original on January 26, 2008. Retrieved April 18, 2008. ↑ Brozan, Nadine (September 30, 1997). "Chronicle". New York Times. Retrieved April 18, 2008. ↑ Russian, Ale; Maslow, Nick (January 14, 2019). "Chris Pratt and Katherine Schwarzenegger Are Engaged: 'Sweet Katherine, So Happy You Said Yes!'". People. Time Inc. Retrieved January 14, 2019. ↑ Pratt, Chris (January 14, 2019). "Sweet Katherine, so happy you said yes!". Chris Pratt verified Instagram account. Retrieved January 14, 2019. I'm thrilled to be marrying you.